The Mossberg 590 is a powerful and useful pump action shotgun. 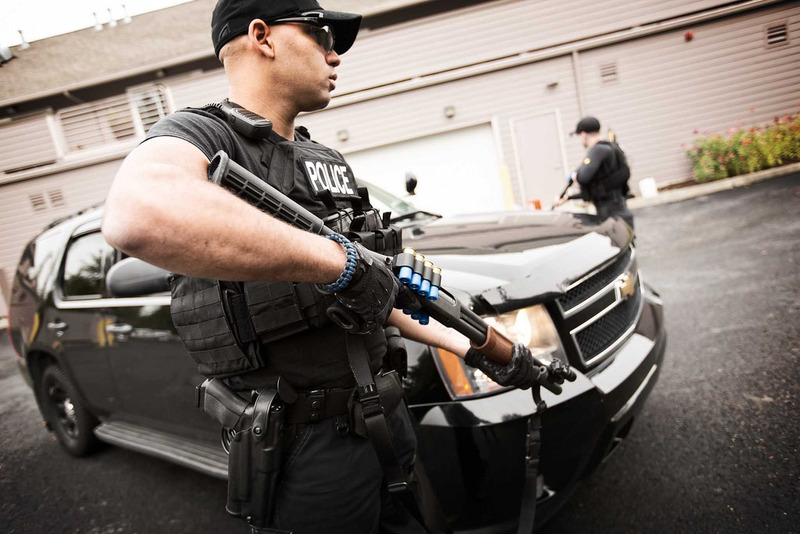 Originally designed with military and police force tactical purposes in mind, it has evolved into being one of the best choices for self and home defense by the everyday gunowner. That’s why we’ve put together a review of the best Mossberg 590 accessories available online. We’ll let you know at the end which one we think is the accessory any smart home defender should own. One of our favorite features of the Mossberg 590 shotgun is the tri-rail forend, which is self-described by the name. That means this review is packed with rail accessories. The special features makes it easy to customize your shotgun to your liking, and you can create the ultimate setup that allows you to act quickly and have accurate shots every time you pick up your firearm. For the sake of self and home defense, there’s nothing quite as important of giving yourself the best shot every time. Materials – The AR-GEAR Shotgun Tactical Front Fiber Optic Sight is an ultra low profile piece in an all black color. It easily snaps into place, behind the front sight on your Mossberg 590, and has a special notch to indicate the correct alignment. It should stay locked in position and won’t budge during firing. The red fiber optic has a 2 mm diameter, and it also easily snaps into place within the sight housing. The fiber optic is simple and affordable to replace, once it loses its life. The simple installation and detachment means you can transfer it over to any other Mossberg 12 or 20 gauge shotguns you may own. Performance – The AR-GEAR Shotgun Tactical Front Fiber Optic Sight is one of the more affordable Mossberg 590 accessories, and it’s a simple way to enhance the function of your tactical shotgun. This is not a night sight, so don’t expect it to be visible when you’re targeting a home invader, but the fiber optic will certainly increase your accuracy during the day time. We can always appreciate a standard sight, such as this, because you can just as easily remove it and snap it onto another similarly gauged shotgun. It’s so affordable, so why wouldn’t you go for it? That being said, the rest of the products within this review won’t come so cheap! What we say – The AR-GEAR Shotgun Tactical Front Fiber Optic Sight is one of the best Mossberg 590 tactical accessories for those who are on a tight budget or simply don’t require a scope for their needs. You can always mount your scope a little higher and still utilize this fiber optic sight, if need be. Materials – The Vortex Optics Tactical 30mm Riflescope Ring is a single scope ring that is constructed of high grade 7075 T6 aluminum. Each ring is finished in matte black. For this review, we’ve selected the medium height profile, which stands at .970 inches tall. 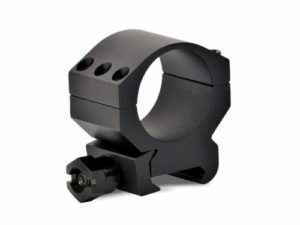 However, the riflescope ring is also available in a low profile, high profile, and extra high profile. The Vortex Optics ring is one of the best at keeping your expensive optics secure because it utilizes six points of retention on each ring, as opposed to the more common four. The Picatinny mounting system installs quickly and smoothly, and it secures in place with a simple hex nut. Performance – Some scopes that you purchase in the higher price range will include a mounting system, but many don’t. 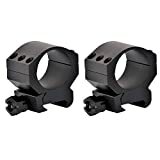 Whether you are in need of scope rings, or you don’t like what was included with your scope, we suggest picking up a pair of Vortex Optics Tactical 30mm Riflescope Rings. We love these rings, and we’ve mentioned them before in past reviews. This is mainly because of the six retention points on each ring. Particularly for pump action shotguns, the extra stability is a must if you’re using a scope. The interior of the rings are smooth, so your optic’s tube isn’t going to get scratched up either. We love that Vortex Optics offers a range of heights, but we believe the medium profile ring is best suited for most Mossberg 590 setups. They’re definitely pricier that your average scope rings, but they’re worth the extra pennies. What we say – The Vortex Optics Tactical 30mm Riflescope Rings make a great replacement for your already existing scope rings and a fantastic addition to your Mossberg 590. Accessories like this are crucial to a totally shock proof weapon. This Vortex Tactical Ring positions the center of the riflescope tube at a height of 0.97 inches (24.6 mm) from the base. Materials – The Streamlight TLR-2 HL Tactical Light is made of a machined aluminum steel housing, with an anodized finish in matte black for rust proof and weather proof construction. Inside the housing is C4 LED technology, which offers up to 50,000 hours of continuous use. The light power is 800 lumens, and this HL model provides a wide beam – the best for home defense. Also within this light is a red laser, which is a highly concentrated beam that can run for up to 45 continuous hours. The power button is ambidextrous for a steady on and off function. There is also a strobe feature that is user programmable. The rail grip clamp system makes this tactical light easy to install or detach, but tooling keys are provided for Picatinny attachment as well. The rugged housing makes the light entirely shock proof and water proof, and it will resist extreme hot or cold temperatures. Performance – Especially if we are discussing home or self defense, and high quality tactical light is integral to those life or death situations. The Streamlight TLR-2 HL Tactical Light is one of the best and most important Mossberg 590 tactical accessories you can invest in. The Streamlight products are definitely more expensive than your average tac light; so, if you can put down a chunk of change on a singular accessory, this would be the one. With the combination of a red laser and a strobing light feature, there’s no way your enemies are getting even close to you. What we say – The Streamlight TLR-2 HL Tactical Light is one of the best Mossberg 590 accessories for both at-home gunowners and professionals in the field. While expensive, it’s worth the investment. Materials – The Burris Fullfield TAC30 Scope is a 30mm metal tube that is less than a foot in length, and it only adds about a pound and a half of weight to your shotgun. The objective lens provides a 1x to 4x magnification, and the reticle is a 3 MOA ballistic dot, which is illuminated. The lenses are precision ground for the one of the clearest pictures a sight can offer, and they have been multicoated to be entirely waterproof. The elevation and windage is adjustable, and the click value is ½ MOA. 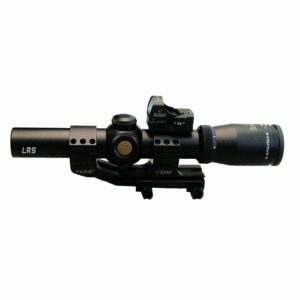 Also included with this scope is a single piece, Picatinny mounting system, providing a two inch forward position on your Mossberg 590. The eye relief value is about three and a half to four inches total. Performance – The Burris Fullfield TAC30 Scope is a marvelous addition to any shotgun or rifle, but particularly to your Mossberg 590. 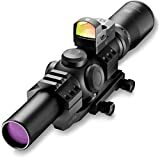 You could leave this scope at the 1x magnification for most situations. We’re not the biggest fans of fixed powers, so a 1-4x range is the most ideal without becoming unnecessary. Burris offers some very quality scopes, and we believe the brand to be reliable; your reticle won’t go blurry on your, and the picture will always be well illuminated and clear. If we could make any changes, we’d want there to be more low light capability. However, you’re definitely getting your money’s worth with this investment. What we say – The Burris Fullfield TAC30 Scope is one of the best Mossberg 590 accessories for those who have more than just home defense in mind. Perhaps your tactical purposes go beyond that. Our favorite accessory for the Mossberg 590 was the Streamlight TLR-2 HL Tactical Light, if we hadn’t given that away yet in the review! If we’re focusing on the defensive purposes of a pump action shotgun, there’s no way you can get by without a really good quality flashlight. With the addition of a laser, you’ll always have the upper hand. 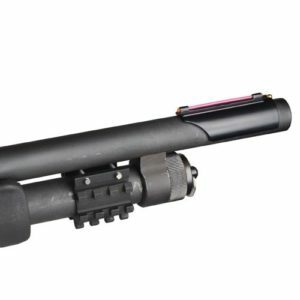 Plus, with the particular style of the Mossberg 590’s tri-rail forend, this is the perfect accessory that will fit onto the shotgun’s setup without interfering with other accessories and won’t require additional mounting gear. Save up the cash, and invest in the Streamlight TLR-2 HL Tactical Light.